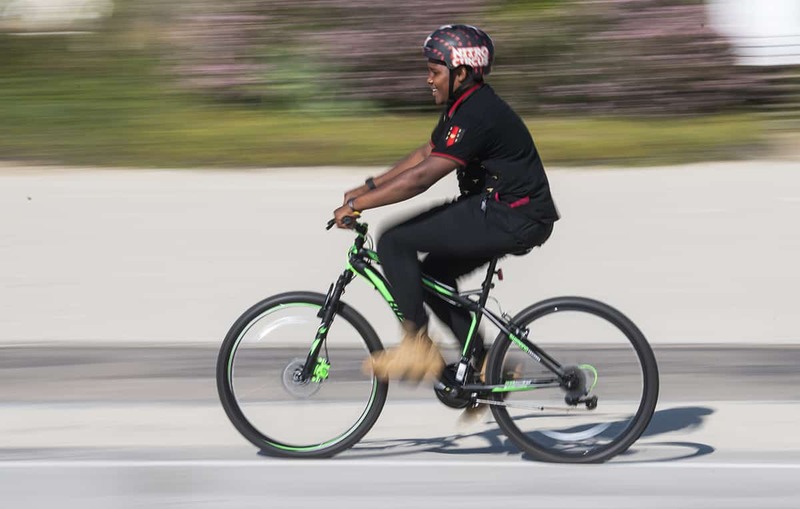 Jassiah Smith, 14, of Long Beach, rides his new bike after the Long Beach police took a collection to replace his old bike after it was stolen over the weekend in Long Beach October 23, 2018. Photo by Thomas R Cordova. A Long Beach mom is praising her local cops for turning her son’s pain into joy after his bike was stolen over the weekend. The saga started when 14-year-old Jassiah Smith got off from his after-school job Saturday and bicycled to a thrift store not far from his house near Poly High School. For days he’d been excitedly planning a fishing trip with his aunt—and he needed some new poles. Smith biked everywhere. He and his aunt were planning to ride to the beach the next day to fish, but when he came out of the store, his bike was gone. Distraught, he phoned his mom. 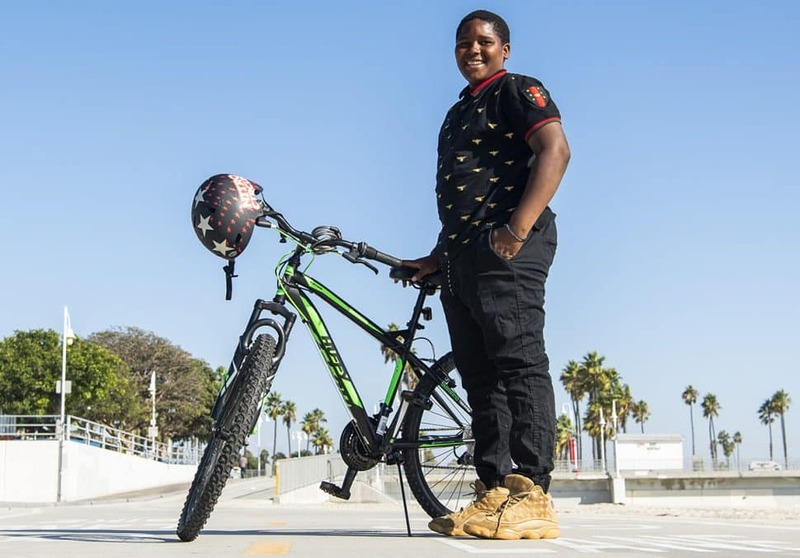 Jassiah Smith, 14, of Long Beach, stands next to his new bike after the Long Beach police took a collection to replace his bike after it was stolen over the weekend in Long Beach October 23, 2018. Photo by Thomas R Cordova. But the truth was, Pettway wasn’t sure she’d be able to get a new one. She’s a single mother of five who’d just recently been able to return to work after being on disability, she said. She knew it was a long shot, but her son called police, hoping to get his bike back. “Down in my heart I’m like nine times out of 10 they’re not going to find the bike,” Smith said. After her son told a police dispatcher what happened, an officer called him to say they’d do their best to get the bike back, but the plan quickly changed. Within a couple hours, an officer arrived at Smith’s home with a new bike, a helmet and a lock to keep it from being stolen. “He said he ran up and hugged him and stuff and said thank you,” Pettway said. Later, Pettway learned it was the dispatchers who took Smith’s original call who quickly raised some money to buy the bike and then enlisted the officer to deliver it. 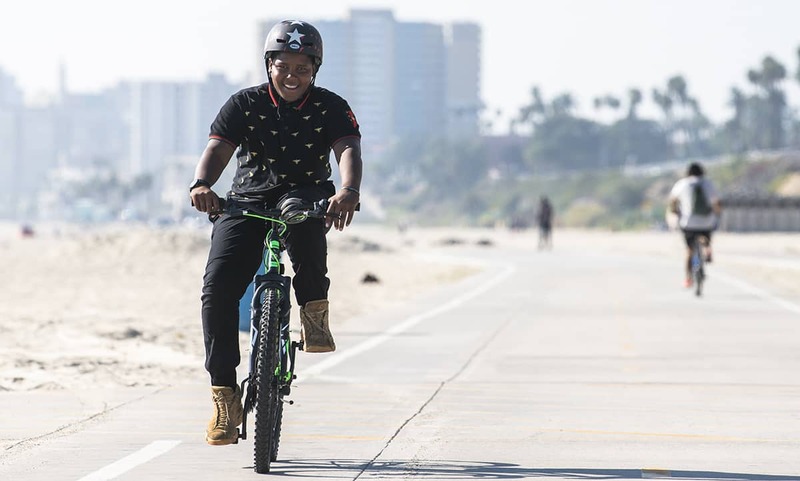 Jassiah Smith, 14, of Long Beach, rides his new bike after the Long Beach police took a collection to replace his bike after it was stolen over the weekend in Long Beach October 23, 2018. Photo by Thomas R. Cordova. Dispatcher Jennifer Cardona, who was the one on the phone with Smith, spearheaded the effort, but employees across all three shifts at the department’s communications center participated by coordinating donations, Long Beach police spokeswoman Arantxa Chavarria said. Pettway said she was thankful, not just because they raised the money, but because a dispatcher warned her son to get out of a stranger’s car who’d offered to drive him around the neighborhood looking for the bike—a potentially dangerous situation, she said. The next morning, Pettway said her son couldn’t stop talking about how blessed he was. The two used to joke about how worn out his old bike was, specifically the uncomfortable seat. But no longer: “He was like, ‘Mom, the seat is so soft; it’s a really good bike,’” Pettway said. 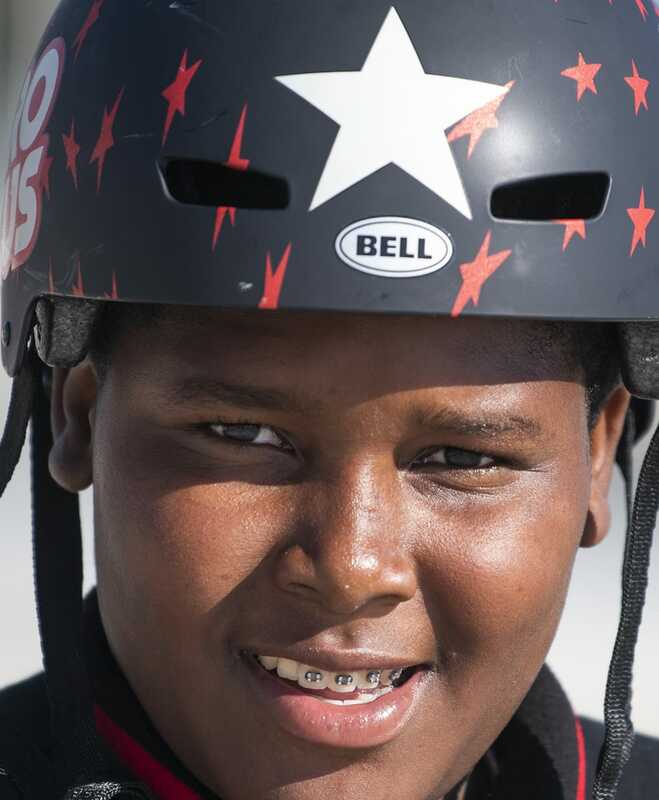 Jassiah Smith, 14, of Long Beach, with his new bike helmet after the Long Beach police took a collection to replace his bike after it was stolen over the weekend in Long Beach October 23, 2018. Photo by Thomas R Cordova. Pettway said the bike couldn’t go to a more deserving kid. Her son is unfailingly kind, works after school and gets good grades. The cops, though, didn’t know any of this when they scrambled to replace his bike. The officer who dropped off the bike said they didn’t want any recognition for what they did, according to Pettway, but they had one request: Send them a picture of the next day’s fishing trip. 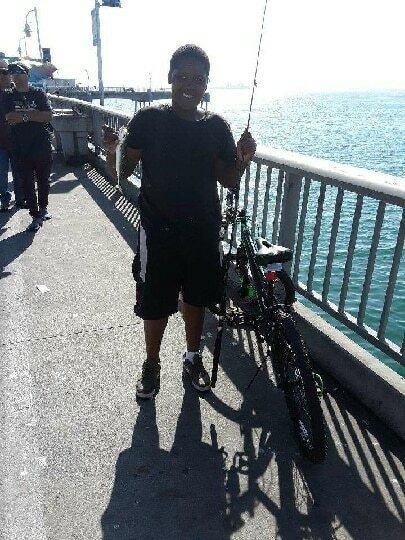 The picture Jassiah Smith sent police of him fishing off the coast of Long Beach where he rode his new bike. Photo courtesy Tiffany Pettway.